Archer Huntington, son of transportation magnate Collis P. Huntington, and Anna Hyatt Huntington, noted sculptor, purchased Brookgreen and three adjoining plantations in January of 1930 as a site for a winter home and as a setting for Mrs. Huntington's sculptures. Construction of the house began the following winter. The home was named Atalaya, a Spanish term for watchtower. Archer Huntington, a noted authority on Spanish culture, designed the house after the Moorish architecture of the Spanish Mediterranean coast. Construction of Atalaya began in 1931, apparently without detailed written plans. Work on the building was not continuous, but divided between it and Brookgreen Gardens over a 2 1/2 to 3 year period. Mr. Huntington, wanting to provide work opportunities for community residents during the Great Depression, insisted that local labor be utilized in its construction. The outer walls of the building form a square, 200 feet on each side, with the front facing the ocean. 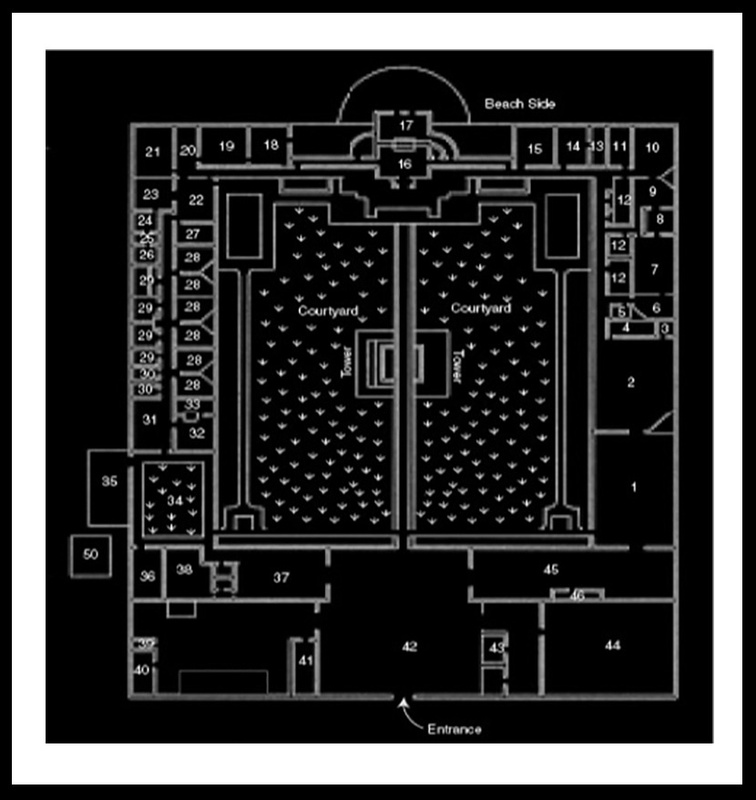 The living quarters consist of 30 rooms around three sides of the perimeter. The one-story brick building is dominated by a square tower that rises nearly 40 feet from a covered walkway that bisects the inner court. It is functional in design, having contained a 3,OOO-gallon cypress water tank. Water drawn from an artesian well was pumped into a 10,000gallon concrete cistern where the sand settled out. From there, it was pumped into the tower tank. The height of this tank gave the water enough pressure to flow through the house. The covered walkway of open brickwork is lined with archways and planters on both sides. Living facilities, including the dining room, sun room, library and bedrooms, occupied the ocean side of the house. The southern wing housed Mr. Huntington's spacious study, his secretary's office and Mrs. Huntington's studio. The studio, with a 2S-foot skylight, opened onto a small enclosed courtyard where she worked on her sculptures. Mrs. Huntington enjoyed sculpting from live animals therefore facilities such as horse stables, a dog kennel and a bear pen were included in the construction. Heating was done entirely by coal room heaters and wood fireplaces. Ramps, instead of stairs, lead from the courtyards up to each entry door and wood was hauled in by small carts. Anna designed special wrought iron grillwork and shutters which were installed on each window to protect against hurricane winds. Most of the inner walls were covered with creeping fig vines to soften the appearance of the rough walls.The dominant tree growing in the courtyard is Sabal palmetto, commonly known as cabbage palmetto, the state tree of South Carolina.The small secondary palm is Butia Capita, commonly known as the Butia or Phoenix palm. The Huntingtons returned to Atalaya after the war for their usual stay in 1946 and 1947. These were the last years they used their home. After Mr. Huntington's death in 1955, most of the furnishings from the house were sent to the Huntington home in New York City. The equipment from Mrs. Huntington's studio was transferred to the new studio at Brookgreen Gardens. The 2,500-acre tract including Atalaya was leased to the state by the Brookgreen Trustees in 1960. Mrs. Huntington died at her Connecticut home in 1973. The history of Atalaya, the Huntingtons, and information on the natural history of Huntington Beach State park is included in a "Visitor's Guide to Huntington Beach State Park". Click on the link below for the Volunteer Application or go to our webstore to make a donation.